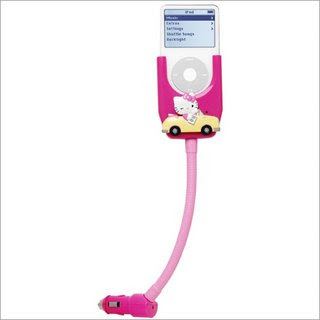 I just don't understand my fascination with Hello Kitty branded anything-especially electronics like coffee makers, alarm clocks and the pictured iPod Car Charger. Is it because she's pink, cute and a cat? (Cats are ok, but I'm a dog lover.) Do I get sucked in by the pink bow and marvel that any cat would let you put anything on its head for an extended period of time? I wasn't a fan of Hello Kitty when I was a girl growing up in the 70's, a teenager in the 80's or a young woman in the 90's. But something changed in my mid-thirties and now I can't get enough of her cuteness. Certainly this iPod car charger would clash with my sporty red/black interior of my 2006 Mazda 3 five-door hatchback. But I still want it. I think I might want it because in the end Hello Kitty represents a youthful culture that I'm no longer a part of anymore now that I find myself aged to 37 years old. But somehow having some Hello Kitty stuff in my arsenal makes me feel young, adventurous and care-free. She's bright and happy and loves having fun. This little Sanrio character captures my heart every time and it's nice to know there are currently 22,000 products and counting out there in the marketplace to satisfy my youthful tendencies.